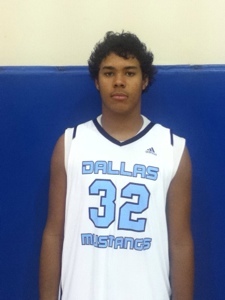 One of fastest rising 2016 Student Athletes out of the State of Texas is Nate Morris a 6’9″ Forward Lancaster HS. Nate Morris has been showing out and caught the attention of Mid Major Hoops Report this High School Season. Mid Major Hoops Report has brought him to our “Players Corner” where we at MMHR are proud to highlight him as one of the up and coming prospects in the 2016 Class…. Nate Morris: 6’9″. 235 lbs. NM: I see myself playing as a power forward. NM: I will be playing with the Dallas Mustangs this summer. NM: I am an unselfish player. It is more about winning as a team than looking good as a player. I am more of a defensive player than an offensive one. NM: I play with lots of heart. I am determined to get stops on defense. I go all out every time I step on the floor. NM: In the last year I have improved on my overall coordination and agility. NM: I am working hard to improve. NM: Right now I really have no preference on where I won’t to go to school. NM: I have visited OSU, & Baylor. NM: I am open to going away from home to college. NM: I am in the gym multiple times a day. NM: I started playing rec ball when I was 6. But I didn’t start playing AAU until 6th grade. NM: Playing on varsity as a freshman. NM: For my team to make it to the state tournament this year. NM: To have the honor of playing in the NBA. Special thanks to the Morris family for allowing us to interview Nate Morris. Good Luck, the rest of the season.